French paradise just a quick flight away! New Caledonia, our closest neighbour, is just a 2-3 hour direct flight from the East Coast of Australia, with regular departures from Sydney, Brisbane, and Melbourne. 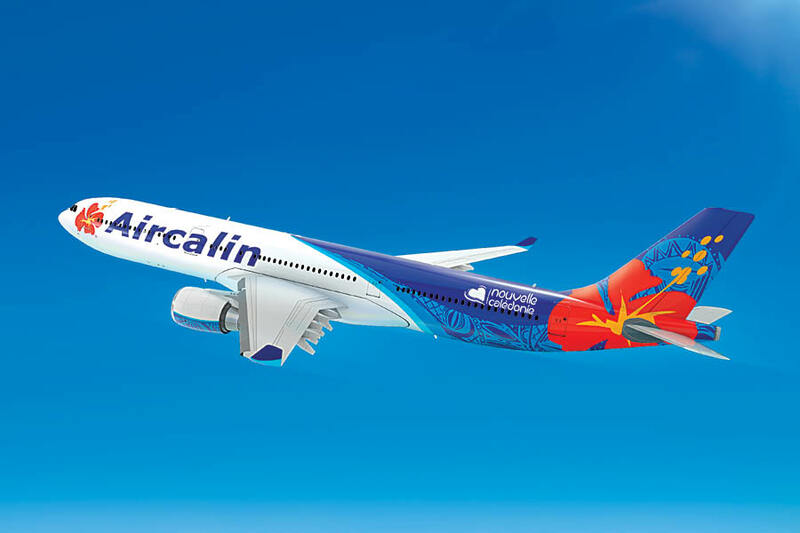 Aircalin, the national airline of New Caledonia is a full-service airline offering a comfortable flight, spacious seating, French cuisine, and complimentary beverages for all passengers. Aircalin is a French airline, also known as Air Calédonie International, which first started in 1983. They provide transport overseas for the New Caledonian people, help increase tourism to the country and carry imported items to the island. The airline now has 22 international flights to 11 destinations in Japan, Australia, New Zealand, Vanuatu, Fiji, French Polynesia, and Wallis and Futuna. The fleet of Aircalin Airbus A320’s and A330’s are used for international flights, and smaller 16 seat Twin Otter is used for flights between Wallis and Futuna. In partnership with other airlines, Aircalin can offer flights to over 100 cities. On board all Aircalin flights both business and economy passengers receive French cuisine and complimentary beverages including French wines. Passengers can upgrade to Business (Hibiscus) Class which includes extra luggage allowance, priority check-in and baggage collection, extra spacious seating and a welcome glass of French champagne. Aircalin offer passengers booked in Economy the chance to bid on a seat in Business Class with My Plusgrade, two weeks before their flight passengers will receive an email inviting them to bid between two specified amounts to win an upgrade and will then be emailed back if they win the bid. New Caledonia is great for water sports lovers, foodies, and sun worshippers alike. There are plenty of fantastic resorts and hotels in New Caledonia. Check out our deals to the Sheraton New Caledonia Deva Spa & Golf Resort which is great for golfers, the newly renovated Le Meridien Noumea in the country’s French cosmopolitan capital city, or L’Escapade Island Resort for a perfect tropical island getaway. Getting to New Caledonia couldn’t be easier with three flights a week from Melbourne taking 3.5 hours, three flights a week from Brisbane with a 2 hour flight time, and six flights per week from Sydney with a total flight time of 2 hours and 45 minutes.